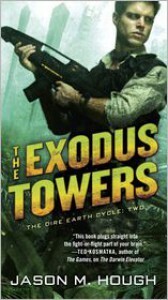 The Exodus Towers takes up shortly after [b:The Darwin Elevator|16127235|The Darwin Elevator (Dire Earth Cycle, #1)|Jason M. Hough|https://d202m5krfqbpi5.cloudfront.net/books/1353966348s/16127235.jpg|21951477]. The "traitors" are now separated from Darwin, Australia after the discovery of a second alien elevator in Belem, Brazil. Skyler Luiken and the colonists are working to set up, well, a colony, using the new alien towers and their transportable auras. 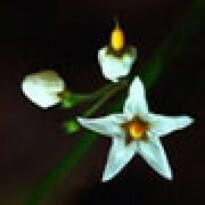 Tania Sharma and her crew are supporting them from above and desperately trying to keep Russell Blackfield from finding out about the colony, while still maintaining the food for air and water trade with him. Meanwhile, Sam Rinn and Kelly Adelaide are still imprisoned by Blackfield within Nightcliff. From the first image of a girl dancing among the ghosts of desolation, I was hooked. Things quickly picked up from there, moving along at a spiralling pace that introduces some intriguing new characters, eager to stake a claim in the aftermath of Neil Platz’s death and Blackfield's anarchy. The Jacobites take on a greater role and Skyler learns that he isn’t as unique as he thought. And all the while, the mystery of the aliens and their purpose continues to loom over them, now with a clock ticking down, if Tania’s calculations on the “Builders’” schedule is correct. For the first half of the book, my thoughts went off the rails because of how much was happening. I hate to use typical review buzz words, but I’m going to have to fling out “action-packed” and “edge of your seat” to describe the suspense, drama and excitement as I hopelessly devolved into subhuman squeals, flails and tears. I may have even uttered a loud “**** YEAH!” at one point. Fortunately, before my review completely deteriorated into “lakjdflajf!! !,” with me huddled in the corner desperately reading [b:The Plague Forge|17262142|The Plague Forge (Dire Earth Cycle, #3)|Jason M. Hough|https://d202m5krfqbpi5.cloudfront.net/books/1363836946s/17262142.jpg|23858940], impatiently awaiting news about when The Dire Earth Cycle is going to be made into movies, the second half of the book settled down and allowed my nerves to do the same. Time is a big factor, with the Builders’ scheduled to – do something – in two years from where the book begins. After the initial action, events skip quickly through the more mundane aspects of taking control of Nightcliff and setting up the colony. This part of the book might seem dull to some, but, as I said, time is a factor and I appreciate the way Hough worked all of this preparation in under the continued, ominous mystery of the Builders. Are the Builders malevolent or benevolent? Their SUBS disease has wiped out/converted 90% of human life on earth, while their elevators and aura towers are protecting the rest. WHAT THE HELL DO THEY WANT??? Also during this time, the characters and their relationships change significantly and sometimes surprisingly. Certain relationships that seemed to have been forged in The Darwin Elevator have not ended up where I expected – and I love that! I might be disappointed that I don’t get what I thought were OTPs, but I love that Hough hasn’t taken the obvious routes. I am really happy to spend more time with Sam, one of my favourite characters from the previous book. She’s a rough and tumble woman of Amazonian height who can hold her own against any man. She began as a dangerously subordinate member of Skyler’s crew, but she really impressed me after Jake’s death, showing a side of herself that isn’t just about the typical bluff and bluster. This continues in Towers, where she gets to display intelligence, leadership and compassion. Meanwhile, Hough continues to reveal that his lead characters are not perfect and sometimes, aren’t even likable. One thing I really want to praise is the diversity of Hough's survivors. Too often, post-apocalyptic stories forget that the rest of the world exists. It's ironic that the survivors have all been sequestered into one small pocket on the bottom of the world, yet Hough has made it clear that, when the crisis hit, everyone from everywhere attempted to make their way to Darwin. That means that the one million remaining humans are a true cross-section of the billions of people that used to live on the planet, and it does not feel like tokenism when we meet characters from various cultures, some of whom don’t even speak English. With thanks to NetGalley and Del Rey for the opportunity to read and review this book.